After the title screen players will have to make the tough choice between Chikorita (top), Cyndaquil (bottom left), and Totodile (bottom right). 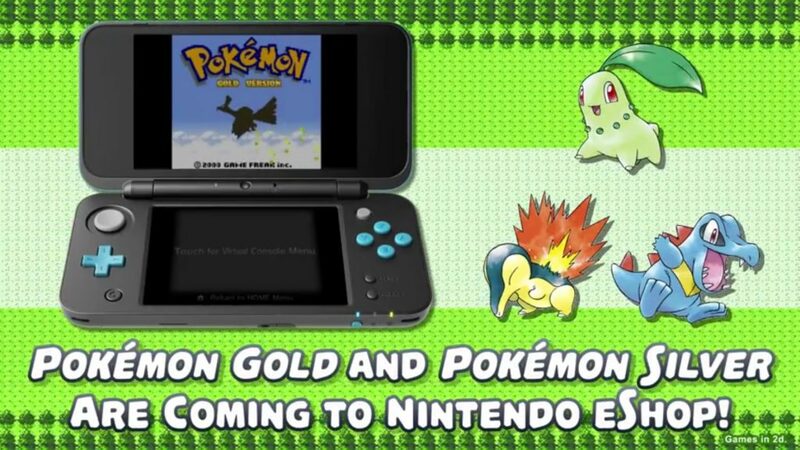 On September 22, Nintendo digitally rereleased their 17-year-old Gameboy Color games “Pokemon Gold and Silver” on the 3DS eShop for players old and new to experience a classic Pokemon adventure. Players can once again catch all the Pokemon they can in hopes of becoming the strongest Pokemon trainer while they save the region from the evil Team Rocket. Gold and Silver are the second mainline installments in the Pokemon series and were originally released in Japan on Nov. 21, 1999, with over 23 million combined sales. The new releases are currently topping the 3DS eShop charts. Despite being the second installment in the series, the Pokemon games are all standalone, and share a similar game design, so any player can jump in without missing anything besides small references. At the time of release the games were beloved by players. “I loved Pokemon Yellow, and Silver just expanded on what was already a great game,” said Brian Scott, a 56-year-old former player. The original releases even hold an 89 percent on the review aggregator “Gamerankings”. However, this is mostly based on reviews from when the game released in the late 1990s and early 2000s, and both Pokemon and gaming have changed since then. In the games, players will choose a starter Pokemon, use it to help themselves capture more Pokemon, and take on the eight Pokemon Gyms to earn a chance to battle for the title of Champion. The graphics are obviously not amazing by today’s standards, but on the 3DS screen they are clear, bright, and charming. Speaking of charming, the music, despite being old chiptune tracks, has very fun and memorable melodies and gives the game a proper sense of adventure. The plots of the games is incredibly simple, but they are serviceable and do not interfere with the gameplay. Battles are the primary focus of most Pokemon games, and that is no different here. Combat involves one-on-one fights between trainers who can each have up to six different Pokemon with up to four different moves each. This is where the games have their depth: between 250 Pokemon and hundreds of moves for them to learn, battles are fun experiences that test players’ strategies and knowledge of the game. “Pokemon Gold and Silver” also gives the players a more diverse set of tactical moves to make battles more than just using your strongest attacks until someone is knocked out. As for what is new with the digital releases, Nintendo updated the games to allow players to trade and battle Pokemon through local wireless, as well as exchange “mystery gifts” with the 3DS’ infrared sensor. However, while the games have aged very gracefully and have been slightly updated, they have still aged. Christopher Cornish, a 25-year-old who never played the games originally, was unsure about playing the games now. Cornish is not exactly wrong; there are several balance issues in the game, such as too little experience points to go around in some areas and some Pokemon not having the right moves for their stats. This leads to an uneven difficulty curve and some Pokemon simply being hard to use on your team. However, despite the games being a bit dated and having a few minor warts, they are a charming experience for anyone who enjoys Pokemon or retro video games.